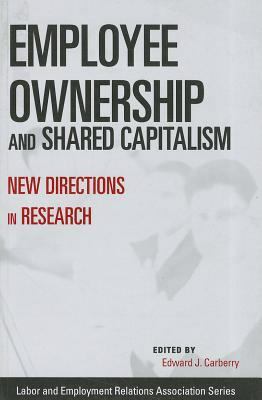 서명/저자 Employee ownership and shared capitalism: new directions in research / ed. by Edward J. Carberry. 발행사항 Champaign, IL: ILR , 2011. 내용주기 Employee ownership and shared capitalism : assessing the experience, research, and policy implications / Edward J. Carberry -- Solidarity and sharing : unions and shared capitalism / John E. McCarthy ... [et al.] -- Improving the quality of home health aide jobs : a collaboration between organized labor and a worker cooperative / Daphne Perkins Berry and Stu Schneider -- Shared capitalism, corporate disclosure, and management’s incentive to signal a positive outlook / Francesco Bova -- Employee ownership, democratic control, and working-class empowerment / Joan S.M. Meyers -- An empirical analysis of risk preferences, compensation risk, and employee outcomes / Fidan Ana Kurtulus, Douglas L. Kruse, and Joseph R. Blasi -- Employee ownership and corporate performance : toward unlocking the black box / Marco Caramelli -- The determinants and consequences of broad-based stock option plans : the view from economics and finance / Serdar Aldatmaz and Paige Ouimet -- Assessing Mondragon : stability and managed change in the face of globalization / Saioa Arando ... [et al.] -- Ohio’s ESOP companies through two decades : growing up or growing old? / John Logue and Jacquelyn Yates -- Employee ownership in Britain : diverse forms, diverse antecedents / Andrew Pendleton. One of the most persistent and important, but often ignored, trends contemporary market economies continues to be the ownership of firms by their employees. Since the emergence of different experiments with employee ownership in the early twentieth century, a growing group of companies and expanding set of institutions have opened the door for firms to share the financial returns of economic production with broad groups of employees. The growth of various forms of "shared capitalism" has meant that currently a little under half of all employees in the private sector own stock in the companies in which they work or receive cash-based bonuses linked to different measures of corporate performance. Employee ownership is a complex phenomenon that can be and has been fruitfully analyzed from a number of different social scientific perspectives. This book showcases the diverse state of cutting-edge academic work on shared capitalism in the United States and Western Europe. Its chapters present a representative cross-section of current research, lively debates, and new research initiatives.. Employee Ownership and Shared Capitalism illuminates shared capitalism''s complexity as an organizational, psychological, sociological, and economic phenomenon that requires deep interdisciplinary understanding.